NORTH GRAFTON, MA; January 31, 2014—Young adults who care for an animal may have stronger social relationships and connection to their communities, according to a paper published online today in Applied Developmental Science. While there is mounting evidence of the effects of animals on children in therapeutic settings, not much is known about if and how everyday interactions with animals can impact positive youth development more broadly. Mueller surveyed more than 500 participants aged 18-26 and predominately female about their attitudes and interaction with animals. Those responses were indexed against responses the same participants had given on a range of questions that measure positive youth development characteristics such as competence, caring, confidence, connection, and character, as well as feelings of depression, as part of a national longitudinal study, the 4-H Study of Positive Youth Development, which was led by Tufts Professor of Child Development Richard Lerner, Ph.D., and funded by the National 4-H Council. Young adults who cared for animals reported engaging in more “contribution” activities, such as providing service to their community, helping friends or family and demonstrating leadership, than those who did not. 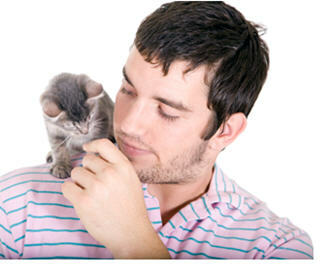 The more actively they participated in the pet’s care, the higher the contribution scores. The study also found that high levels of attachment to an animal in late adolescence and young adulthood were positively associated with feeling connected with other people, having empathy and feeling confident. “We can’t draw causal links with this study but it is a promising starting point to better understanding the role of animals in our lives, especially when we are young,” said Mueller. To learn more about how and if interacting with animals is linked with positive youth development future studies need to look at specific features of human experiences with animal experiences, as well as how these relationships develop over time, and include a larger, more diverse sample, Mueller noted. Mueller has a unique vantage point from which to study human-animal interaction. As both a developmental psychologist and a faculty member at the Cummings School, she has insight into both sides of the relationship between people and animals, and is a leader in bringing the developmental perspective to the field. “Is human-animal interaction (HAI) linked to positive youth development,” Mueller, Megan K. Applied Developmental Science. First published ahead of print January 31, 2014 as doi: 10.1080/10888691.2014.864205. Press materials provided by Tufts News.